Crafted from soft 300 thread count Egyptian cotton with Percale weave, this luxury 12-piece bedding set features an exotic leaf motif in a palette of deep and soothing hues on a neutral light taupe ground. This bed in a bag features stylish and tailored decorative pillow covers for a distinctive look and includes an oversize flat sheet to accommodate deep and pillow top mattresses. 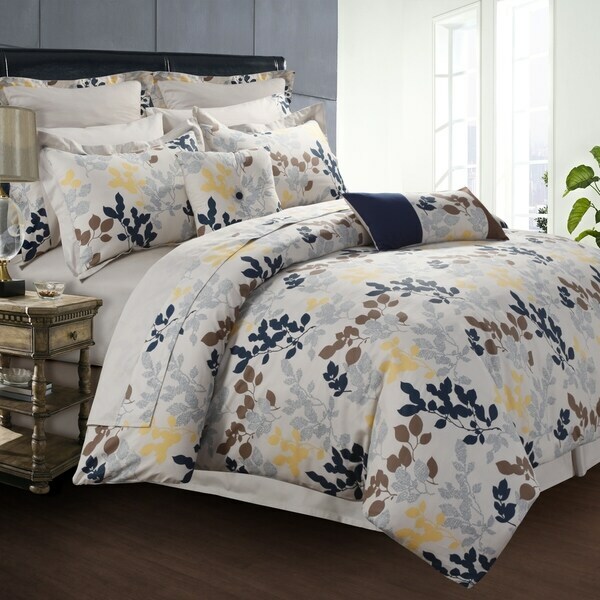 We received this queen comforter set recently and absolutely love it! The comforter is nice and soft, very cozy! The pillow shams are on the same material and are very soft. The sheets and pillow cases aren't as soft as we hoped, a little scratchy...but we are used to a higher thread count. The throw pillows are adorable and compliment the bedding. The colors online are true to what you see in person. The comforter is nice and long so we didn't need to use the bed skirt, but is a nice option to have. This is a great deal for all that you get. Definitely recommended! When I first received this I was a bit disappointed because it was taupe and not white, I trusted the picture and did not read all of the description. I decided to keep it anyway because it was still the only set I found that is going with the color scheme I want. And I have learned to love it, plus it's very comfortable. The reason I only gave 4 stars was the wrinkles. Of course when I received it, it needed to be ironed so I washed every piece first. I had hoped that the dryer would be my friend and lessen my job but no. i expected to iron the bed skirt and pillow cases... But not the comforter. I would recommend this to anyone but a heads up, it's going to take a bit more prepping than any other bed set I have had. This bedding is awesome. I love the quality and for a very inexpensive price too. This was a great bargain for a quality bed set. Great color and went well with the decor in my daughter's bedroom. I would recommend to anyone. I bought this set for my bedroom. I love everythinG about it accept for the bedskirt. The material is beige, looks very cheap and wrinkled when I put it on my bed. I will not be using the bed skirt. My nineteen year old daughter loves this set! It was a little pricey but worth it. Color is very pretty , and it come with a lot for the pieces. This 12 piece set is a bargain for everything you get. Great quality and look! Top quality and exactly what I wanted! This is so pretty in my guest bedroom!! Love it!!! These look great and I think they will last forever. I should have read the reviews more carefully because as others have said, this is most definitely not a white bedspread! I really like the pattern but the base is closer to beige or tan and did not look good at all with our gray walls and therefore had to be returned. "What is the drop length of the dust ruffle"
The bed skirt drop is approximately 16 inches. "Is the Euro Sham just a cover or do I need to purchase inserts for it?" You will need to buy the inserts for it. The colors work perfectly with my color scheme in the room. "Can you please list the 12 pieces for the King size?" "Will the king size 12 piece set be coming back in stock? " It will be available at the end of October. "What is the background color? It appears white but I'm hoping its off white. Thank you." The background is a neutral light taupe ground. "is this a comforter or a Duvet?" This is an actual comforter, it does not need an insert.